Town’s lofty position at the top of the League One table this season has come as no surprise to striker Danny Hylton. With 11 games to go, starting at Plymouth Argyle this afternoon, the Hatters sit at the summit, five points in front of second-placed Barnsley. After coming up from League Two last season, Hylton always knew they had it in them to mount a challenge for the Championship, saying: “There’s no arrogance in this team, we’re confident, we believe in ourselves and we work hard for each other. “So if you said to me last season ‘will you be sitting top of the league?’ I wouldn’t be thinking there’s no chance of that. "If you see the way these lads train and work every single day, they’re in the gym after, they work tirelessly, there’s no surprises that we’re sitting top of the league. Town had seen their lead cut to just two points ahead of kick-off against Rochdale last Saturday, with 10-man Barnsley winning 3-0 at Southend. “But Barnsley are a good side, and we need to just look after what we do. “If we keep winning and keep that gap, then who knows what will happen? Both teams in the chasing pack, Sunderland and Portsmouth triumphed as well, meaning Luton’s victory took on even more importance. 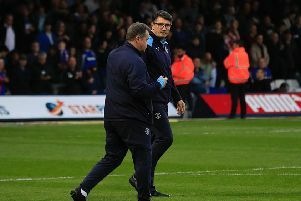 Boss Mick Harford declared he hadn’t been keeping up with goings on elsewhere though, saying: “I didn’t know that, we can only concentrate on us. After Saturday’s visit to Home Park, Luton are on the road again in midweek, heading north to Bradford City in what is another lengthy journey. Hylton added: “It’s two tough away games, but we’ll just take it like we do every other game.